Some of the massive freight containers that pollute our landscape every time we drive by any of our country's many ports, are now seeing better days. 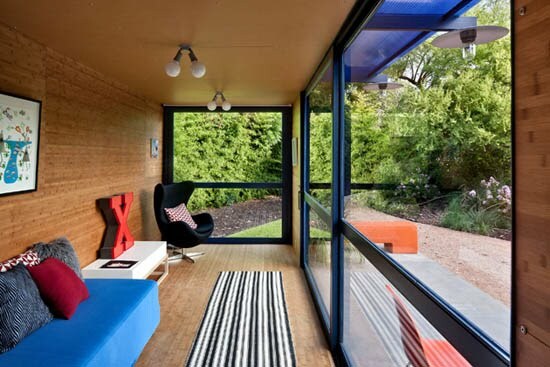 They're being recycled into very affordable and innovative living spaces. 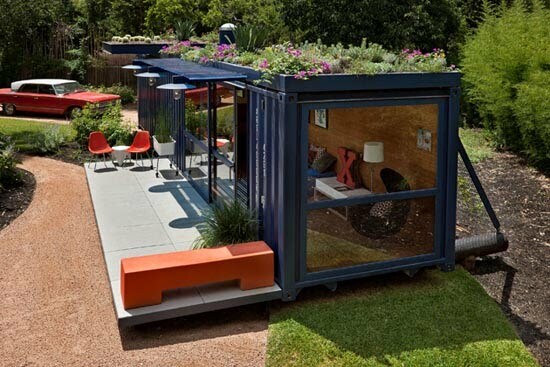 Container architecture is becoming a hot trend. From having a lonesome purpose in life, these dreadful steel boxes are now becoming small homes, vacation cabins, business and even multi-unit buildings. It's an eco-friendly and a very flexible option to build. What a better example than this adorable, and very blue, San Antonio guest house designed by Poteet Architects — who were recently honored with the 2010 San Antonio AIA Design Award for the project. This is proof that any small space, no matter its origin, can be transformed into a very functional and chic home. The secret is in the planning and the details. And what I love most about this guest house is the fact that everything has its place — and yes, that has always been my creed.